I apologize for sending out this newsletter almost a month late—it should have been dispatched at the end of May. I was intending to compile this latest edition after I had finished writing the manuscript of my Balchin biography but time has unfortunately got the better of me. I have been working solidly on the book since last October and am now very close to reaching the end—it will definitely be finished by the end of the summer. After that I envisage a lengthy process of revising, condensing and generally improving the text but I am going forwards not backwards and there is a clear end in sight! I’m not setting any likely publication date at present as I’ve still not made much headway with finding a publisher and/or agent but once the manuscript has been knocked into shape that should free up time to tackle those activities more assiduously. I hope that some of you have been following my ‘Nigel Balchin Book of the Month’ feature on the website. I’ve enjoyed writing the profiles of the six books I’ve chosen so far and I hope they have given you some reading recommendations. A new ‘Book of the Month’ is posted on the site in the first few days of every month so do keep checking back during the rest of the year as I reveal my remaining six choices of the best of Balchin’s novels and non-fiction. The website is long overdue an update plus a design overhaul—these are both on the way later this year but time is a precious commodity right now and finishing writing the biography has to be my number one priority for the foreseeable future. A new webmaster has recently joined my ‘team’ and he is full of good ideas for improving the presentation and functionality of the site. Unfortunately, he is even busier than I am but hopefully we can get together and implement some improvements before very much longer. Creative energy is also at a premium so if anyone has any good ideas for Balchin-related topics that they would like me to tackle in future issues of this newsletter then I would be glad to hear them and I will certainly take action on the best suggestions. Enjoy the summer and I’ll be back with another edition in August/September. I want to devote the rest of this newsletter to a consideration of Balchin’s work as a film scriptwriter, a relatively little-known aspect of his writing. Most Balchin devotees know that he won the 1956 BAFTA for his screenplay for The Man Who Never Was, and some that he was responsible for what he self-mockingly referred to as “the first folio edition of Cleopatra”, but the extensive and varied scripts he wrote in Hollywood and elsewhere have so far received little attention (although this will of course be remedied in my forthcoming biography). Balchin’s first connection with the film world came in 1944, when he was put under contract by the British arm of MGM—probably because of the success of The Small Back Room the year before—with a view to writing scripts for them once the war was over. This arrangement was subsequently dissolved before it had the chance to bear any fruit and so the first screenplay that Balchin penned was Fame is the Spur for the Boulting Brothers in 1946. This was the story of a radical Labour politician—expertly played by Michael Redgrave—whose beliefs soften and become more malleable after he assumes high office. Fame is the Spur is slightly plodding by modern standards but still stands up as an interesting and watchable movie. 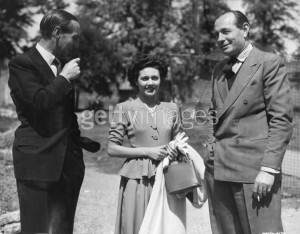 Balchin (left) on the set of Mine Own Executioner, with Barbara White (Molly Lucian) and director Anthony Kimmins. A few weeks after Fame is the Spur first played in cinemas, Balchin’s adaptation of his own novel Mine Own Executioner was released onto the British picture-house circuit. Again, twenty-first century cinema critics may well be able to pick holes in the film—and it certainly cannot match Powell and Pressburger’s excellent 1949 version of The Small Back Room—but it remains a powerful and impressive piece of work nonetheless. Directed by Anthony Kimmins (who had worked on several of George Formby’s films before the war) for Alexander Korda’s London Films, it starred American actor Burgess Meredith as the psycho-analyst Felix Milne and Ireland’s Kieron Moore as his disturbed patient Adam Lucian. After Mine Own Executioner there followed a five-year hiatus in Balchin’s scriptwriting career when he concentrated on writing books and short stories and also presided helplessly over the disintegration of his marriage. It is during this period that one finds intriguing evidence of ‘one that got away’. This was a film of A Sort of Traitors (fitted with a Balchin script) that would have starred Richard Attenborough and was to be made by the same team (Anthony Kimmins directing, with Alexander Korda producing) that had brought Mine Own Executioner to the screen. It is unclear exactly why this project fell through in 1949 but Attenborough was in great demand at the time and may have been lured elsewhere by the prospect of a better offer. The book was finally filmed by the Boulting Brothers in 1960 in the guise of Suspect. Balchin returned to the scriptwriting game in 1952 and duly delivered one of his finest-ever scripts. Mandy was the story of a young girl born deaf and dumb whose parents (the mother was played by Phyllis Calvert) quarrel regarding how best to direct her education. It eventually falls to the highly dedicated headmaster of a special school (Jack Hawkins) to coax the first words out of the mouth of the silent little girl, who was brilliantly portrayed by eight-year-old acting prodigy Mandy Miller. 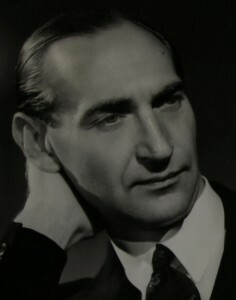 The movie was made by Ealing Studios and directed by Alexander Mackendrick whom Balchin knew personally because both men were connected with the J. Walter Thompson advertising agency. Mandy is entertaining, touching and compassionate (but never mawkish) and constitutes a definite high-water mark in Balchin’s filmography. Mandy Miller was given the lead role in Mandy on the strength of a bit part she had played in Mackendrick’s 1951 Ealing Comedy The Man in the White Suit. Miller retired from the acting profession aged eighteen when she moved to New York, and is now perhaps best known for having sung the lead vocal on the children’s favourite ‘Nellie the Elephant’! In the following year, 1953, Balchin scripted Malta Story, a run-of-the-mill war film dramatizing the heroism of the tiny Mediterranean island during World War Two. It starred Alec Guinness, Muriel Pavlow and Jack Hawkins (again) and is workmanlike and watchable, but little more than that. Balchin returned to his best form a few years later when he delivered his script for The Man Who Never Was. This was a wartime espionage caper released when the great British war film boom of the 1950s was at its height. Based on a true story (as brought to life in Ben MacIntyre’s acclaimed 2010 book Operation Mincemeat), The Man Who Never Was is about a piece of cunning dreamed up by the British Navy to deceive the Nazis about the Allies’ invasion of Europe. The plan caused the Germans to divert troops away from Sicily, significantly reducing Allied casualties. In the film, the Navy arrange for a corpse bearing false documents to be washed up on a Spanish beach. The information carried by ‘Major William Martin’ finds its way into the hands of a local Nazi agent and his masters in Berlin swallow the deception hook, line and sinker. Elements of The Man Who Never Was (especially a tiresome romantic subplot featuring sulky Hollywood siren Gloria Grahame) are less than satisfactory but the level of detail conveyed in the film is fascinating and it remains a fast-moving and enjoyable picture. Balchin’s BAFTA was well deserved. Until the mid-1950s, Balchin had understandably been employed predominantly to produce scripts that played to his strengths as a writer. Thus he had written screenplays for films such as Malta Story and The Man Who Never Was that had a World War Two setting, a movie about a character with a marked disability (Mandy) and pictures with some sort of psychological element (Fame is the Spur and Mine Own Executioner). But then in 1956 Balchin landed a lucrative nine-picture contract with Twentieth Century Fox and of necessity became more of a jack-of-all-trades, having to turn his hand to whatever project Fox tossed into his in tray. He was therefore removed from his natural comfort zone as a screenwriter and it must be no coincidence that most of the Fox films he worked on are forgettable, some were never made and a few are practically unwatchable. Sumar Films, the affiliate of Twentieth Century Fox that produced The Man Who Never Was, promoted the film by distributing thousands of fake ID cards, all bearing the name ‘William Martin’, the name assigned to the cadaver on whom the false documents were planted, and with a handy blank space available in which a passport photograph could easily have been affixed. This stunt did not go down very well in Portsmouth, and led to security being tightened at all naval bases in the area, in expectation of a flood of ‘William Martins’ trying to gain unauthorized admittance. Balchin’s first script for Fox, Twenty-Three Paces to Baker Street, is one of his best. This is a thriller (set in London) about a blind playwright who overhears two people in a pub plotting a murder and then sets out to solve the mystery when the law show little interest in following it up themselves. In the fashion of the time, an American actor (Van Johnson) was sent to England to inhabit the lead role and his performance certainly falls into the ‘acquired taste’ category. By way of compensation, native thespian Cecil Parker supplies an enjoyably lugubrious turn as the playwright’s manservant who performs much of the legwork required to track down the criminals. Twenty-Three Paces to Baker Street is unusual and suspenseful, and holds the viewer’s attention right to the very end. Balchin himself said that the film was “awful” but I think he was wrong on this occasion because it is not a bad picture at all. Another notable Fox project that Balchin was involved in was Circle of Deception. The premise is very similar to that of The Man Who Never Was: the British military need to confuse the enemy regarding the whereabouts of an attack on Nazi-occupied France in 1943. Rather than using a corpse laden with false documents, this time they decide to go the whole hog and use a false agent instead. A highly strung man, whom psychological tests identify as being likely to crack under pressure, is parachuted into France and soon captured by the Germans. He is tortured and tries to commit suicide but the cyanide pellet that has been secreted inside his false tooth proves to be a dummy and so the agent is left with no option but to blab to his captors and divulge the secret plans. Having done so he is racked with guilt as, in his opinion, he has failed his mission (when in fact he has succeeded). Based on a short story by Evelyn Waugh’s brother Alec, Circle of Deception is generally a lacklustre piece of film-making but at least Balchin was once again being employed on projects that suited his talents. This one has probably the most ‘Balchinesque’ theme of any of the movies he had a hand in and it is clear that the psychological implications of the storyline had fully engaged the writer’s imagination. Alas, the same cannot be said for the rest of Balchin’s Fox output and for most of the handful of scripts that he wrote for other film companies in the early 1960s. Whether with his blessing or not, he began to specialize in films with a religious, cultural or moral dimension, but these works, such as The Singer Not the Song (missable, unless you really have to see Dirk Bogarde in skin-tight black leather trousers) and Barabbas (“unacceptable in its pain-preoccupation and its religiosity” as one critic put it), were blighted by unappealing narratives. Cleopatra is the most well known of the final clutch of pictures that Balchin worked on but his script was changed out of all recognition by the time the film was released—and his name was missing from the credits—so it cannot truly be regarded as a ‘Balchin film’. The table at the foot of the page shows a complete list of the movies that Balchin scripted, but please note that I have omitted those such as Cleopatra in which very little of Balchin’s handiwork made it onto the screen. Balchin worked on three movie projects with John and Roy Boulting. After Fame is the Spur, the brothers brought two of Balchin’s own stories to the silver screen. One was Suspect, an admirable adaptation of A Sort of Traitors. The other was 1955’s Josephine and Men, a greatly expanded version of ‘Among Friends’ from the short story collection Last Recollections of My Uncle Charles. I watched Josephine and Men for the first time a few weeks ago on YouTube. If you plan to do the same then my advice would be ‘approach with caution’ as it is far from being Balchin’s finest hour! Turning finally to films adapted from a Balchin source, five have so far hit the screen. In chronological order, these are Mine Own Executioner (1947), The Small Back Room (1949), Josephine and Men (1955), Suspect (1960) and Separate Lies (2005), Julian Fellowes’ version of A Way Through The Wood. The Small Back Room stands head and shoulders above the rest of these films in my opinion but Suspect, which was an experiment in low-budget film-making by the Boulting Brothers, is never less than watchable and Separate Lies is very competently made. Both Sundry Creditors and Seen Dimly Before Dawn were investigated for cinematic adaptation in the 1960s but neither project came to fruition. More recently, I have heard talk that proposals for both Darkness Falls From the Air and In the Absence of Mrs Petersen have been doing the rounds but transfer to the screen has so far remained elusive. The Fall of the Sparrow would also seem to possess great cinematic potential but to date there has only been a 1965 Independent Television production of that novel. The BBC also broadcast a great many adaptations of the novels (on both radio and television) from the mid-1940s onwards. Balchin’s film scripts (with viewing recommendations shown in red).